Production: Les Films Cissé, in association with Atriascop and Midas, with assistance from the government of Mali, the Burkino Faso Ministry of Information and Culture, the French Ministry of Culture, CNC, UTA, WDR Television; in color; running time: 106 minutes, English version 104 minutes; length: 9,401 feet. Released 1987. Producer: Souleymane Cissé; screenplay: Souleymane Cissé; photography: Jean-Noël Ferragut; editors: Dounamba Conulibaly, Andree Davanture, Marie-Catherine Miqueau, Jenny Frenck, Seipati N'Xumalo; sound: Daniel Olivier, Michel Mellier; art director: Kossa Mody Keita; music: Michel Portal, Salif Keita. ( Nianankoro's Mother ); Ismaila Sarr ( Djigui ); Youssouf Tenin Cissé ( Attu's Son ); Koke Sangare ( Komo Chief ). Pines, Jim, and Paul Willemen, editors, Questions of Third Cinema , London, 1989. Braunschweig, Stéphane, and Antoine de Baecque, "Pionnier en son pays: Entretien avec Souleymane Cissé," in Cahiers du Cinéma (Paris), March 1986. Variety (New York), 13 May 1987. Roud, Richard, in Guardian (London), 21 May 1987. Tesson, Charles, in Cahiers du Cinéma (Paris), June 1987. James, Caryn, in The New York Times , vol. 137, C37, 8 October 1987. Adair, Gilbert, in Sight and Sound (London), Autumn 1988. Walters, Margaret, in Listener (London), 20 October 1988. French, Philip, in Observer (London), 23 October 1988. Solanka, Adeola, "Sands of the Time," in Guardian (London), 27 October 1988. Leahy, James, in Monthly Film Bulletin (London), November 1988. Johnston, Sheila, "Tales of a Painful Initiation," in Independent (London), 25 November 1988. Witte, K., "Blickvermeidung und Blickschaerfung," in Filmbulletin (Winterthur, Switzerland), no. 5, 1989. Diawara, M., "African Cinema Today," in Framework (London), no. 37, 1989. Stein, Elliot, "The Bloody and the Brightest," in Village Voice (New York), 18 April 1989. Chiacchiari, F., in Cineforum (Bergamo), June 1989. Gadjigo, S., "Africa through African Eyes," in Research in African Literatures (Columbus, Ohio), no. 4, 1992. Cunneen, Joseph, in National Catholic Reporter , vol. 29, no. 29, 21 May 1993. Gentile, P., "In the Midst of Secrets: Souleymane Cisse's Yeelen ," in Iris (Iowa City), no. 18, Spring 1995. Lalanne, Jean-Marc, and Frédéric Strauss, "Terre et mère: Entretien avec Souleymane Cissé," in Cahiers du Cinéma (Paris), no. 492, June 1995. MacRae, S.H., " Yeelen : A Political Fable of the Komo Blacksmith/Sorcerers," in Research in African Literatures (Columbus, Ohio), vol. 26, no. 3, 1995. "Special Issue on Yeelen ," in Avant-Scène du Cinéma (Paris), no. 476, November 1998. Yeelen has provided the West with one of its all too rare glimpses of African cinema. Made in Mali, it is the fourth full-length feature to have been directed by Souleymane Cissé, who studied at the VGIK film school in Moscow under Mark Donskoi. 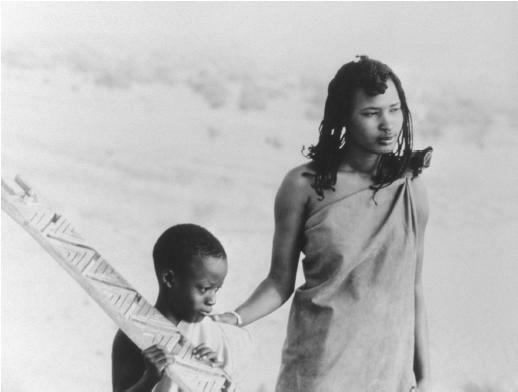 Den Muso (1975) was the first feature to be shot in Mali in the Bambara tongue and concerned the plight of child-mothers; Baara (1978) looked at the problems of the peasantry and the growing working class; Finye (1982) focussed on student unrest. After making Finye Cissé said, "I hope in the future to be able to make films in which the ancient depths of African culture will surge up again. To this end, I spend my time visiting old men who tell me stories of the past, true or mythical. A cinema imitating that of America or Europe will be in vain. We must immerse ourselves in our own sources." In Yeelen Cissé has drawn on just such traditional sources in creating a narrative which describes in stark and elemental detail (images of light, water, earth, and fire abound in the film) Nianankoro's epic quest. He is a young African from Bambara pursued by his vengeful father, Somo, who has devastating magic powers that he often uses for evil purposes. Aided by his mother, Nianankoro sets out both to avoid his father and to seek help elsewhere. On his journey, dogged by his father, he manages to come to the aid of a rival tribe which is being attacked. Using magic powers of his own, Nianankoro repels the would-be invaders and the grateful king allows him to "acquire" the king's own wife, Attu, as a gift for his labours. She subsequently becomes pregnant, and the young couple finally reach the home of Nianankoro's uncle, Djigui. Nianankoro explains to Djigui that his father turned against him because he wanted to use his magic powers for the common good. The film ends with a confrontation between father and son in which they are both destroyed by a blinding light. Attu arrives with her young son, gathers two fetish objects left behind by the men in their deadly struggle, then walks away with the child. For many Western critics the film was perceived in classic psychoanalytic terms as an Oedipal drama, a conflict between father and son for control over power and knowledge (indeed Nianankoro's "marriage" to the king's wife draws a parallel with Oedipus's marriage to his own mother). This appraisal, comforting and familiar though it is, has not met with the approval of the Africans themselves who regard psychoanalysis as incompatible with their own cultures, nor does it do any justice to what, after all, is the major quality of the film—its extraordinary mythic dimension. As Cissé himself says, "For every individual imagination is personal, intuitive. For me imagination is planetary, cosmic." The cosmic is effortlessly represented by many different aspects of the film: the grandeur of the landscape, an immensity of sky, a searing relentless sun, the Great Tree in each village scene under which counsel is taken, a sense of timelessness in the unfolding of the narrative, and the characters themselves, who have a universal resonance in the dignity and ardour of their endeavours. The symbology, too, apparent in the use of a magic eye which is to be found both in the wing of Kôré, sceptre of the initiates, and in Somo's magic pestle, seizes the imagination in a direct and compelling manner. Yeelen is a profound evocation of a belief system which is founded on magic. As Cissé says, "In Africa we are all believers in magic. But for Africans, this magic is a part of the everyday experience. What is thrown into relief is not magic; it is knowledge and the power of knowledge. People who ignore this will not be able to understand the film."